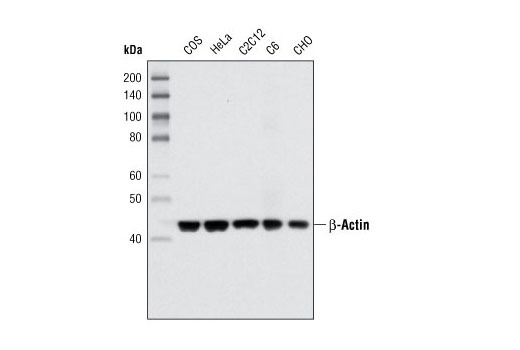 Western blot analysis of extracts from various cell types using β-Actin (8H10D10) Mouse mAb. 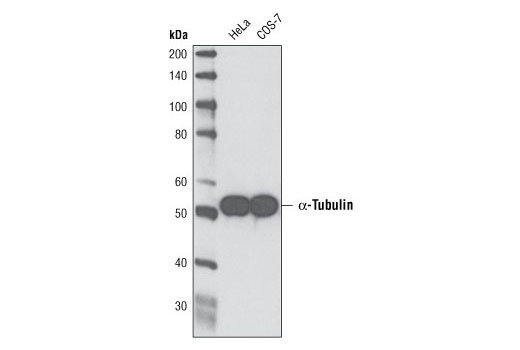 Western blot analysis of extracts from HeLa and COS-7 cells using α-Tubulin (DM1A) Mouse mAb. 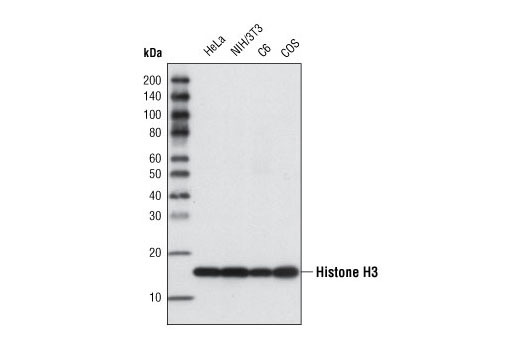 Western blot analysis of extracts from various cell lines using Histone H3 (96C10) Mouse mAb. After the primary antibody is bound to the target protein, a complex with HRP-linked secondary antibody is formed. The LumiGLO* is added and emits light during enzyme catalyzed decomposition. 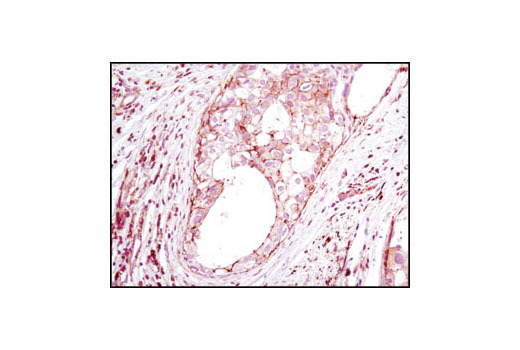 Immunohistochemical analysis of paraffin-embedded human breast carcinoma using β-Actin (8H10D10) Mouse mAb. 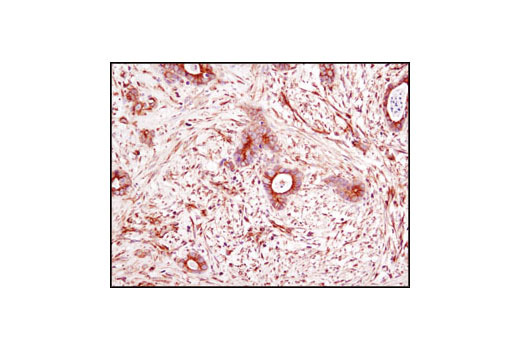 Immunohistochemical analysis of paraffin-embedded human colon carcinoma using α-Tubulin (DM1A) Mouse mAb. 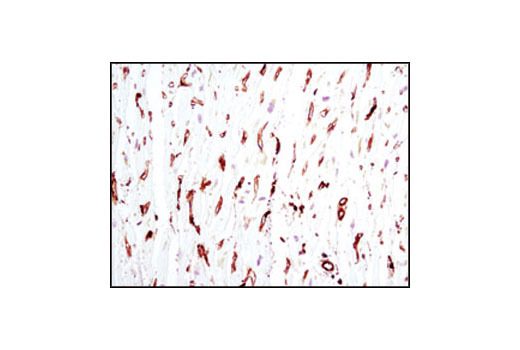 Immunohistochemical analysis of paraffin-embedded human heart using β-Actin (8H10D10) Mouse mAb. Note the lack of staining of cardiac muscle. Flow cytometric analysis of HeLa cells using α-Tubulin (DM1A) Mouse mAb (blue) compared to Mouse (G3A1) mAb IgG1 Isotype Control #5415 (red). Anti-mouse IgG (H+L), F(ab')2 fragment (Alexa Fluor 488 conjugate) #4408 was used as a secondary Ab. Flow cytometric analysis of HeLa cells using β-Actin (8H10D10) Mouse mAb (blue) compared to a nonspecific negative control antibody (red). 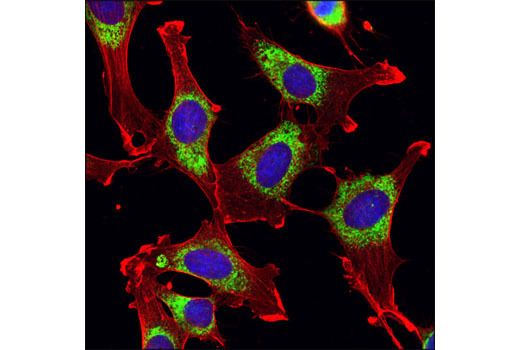 Confocal immunofluorescent analysis of HeLa cells using α-Tubulin (DM1A) Mouse mAb (green). Red = Propidium Iodide (fluorescent DNA dye). Confocal immunofluorescent analysis of NIH/3T3 cells using β-Actin (8H10D10) Mouse mAb (red) and PDI (C81H6) Rabbit mAb #3501 (green). Blue pseudocolor = DRAQ5® #4084 (fluorescent DNA dye). The Loading Control Antibody Sampler Kit provides an economical means to detect a variety of housekeeping proteins. The kit contains enough primary and secondary antibodies to perform two western blot experiments. Each antibody in the Loading Control Antibody Sampler Kit detects endogenous levels of its target protein and does not typically cross-react with other proteins. Monoclonal antibodies are produced by immunizing animals with synthetic peptides corresponding to residues near the amino terminus of human β-actin, the carboxy terminus of human histone H3, or with full-length chicken α-tubulin purfied from brain extracts. The epitope of α-Tubulin (DM1A) Mouse mAb recognizes residues surrounding Val440 of human α-tubulin protein. Housekeeping proteins perform numerous basic functions within the cell and are constitutively expressed at high levels in a variety of tissues and cell types. 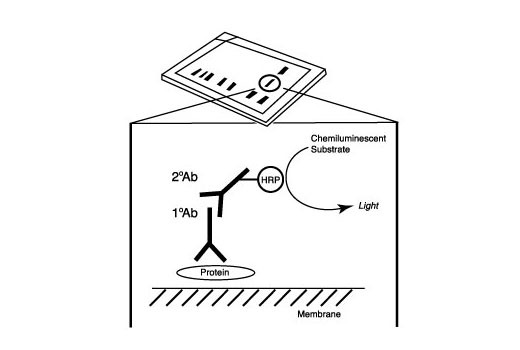 Western blot analysis commonly uses housekeeping proteins such as β-actin, histone H3, and α-tubulin as loading controls. 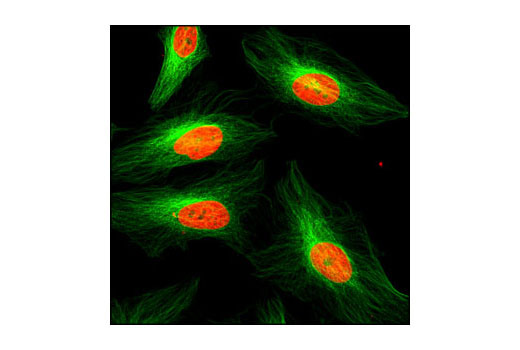 Actin is a ubiquitous protein and a major component of the eukaryotic cytoskeleton. Actin exists mainly as the F-actin fibrous polymer (1). Globular tubulin subunits made up of α- and β-tubulin heterodimers are the building blocks of microtubules, one of three types of cytosolic fibers that comprise the cytoskeleton (2). Histone proteins, including histone H3, make up the primary building block of chromatin known as nucleosomes. Modulation of the chromatin structure plays an important role in the regulation of transcription in eukaryotes (3). Workman, J.L. and Kingston, R.E. (1998) Annu Rev Biochem 67, 545-79. Westermann, S. and Weber, K. (2003) Nat Rev Mol Cell Biol 4, 938-47.